The tiarella is lovely especially at this time of year, Is it a bee magnet like heuchera flowers are? 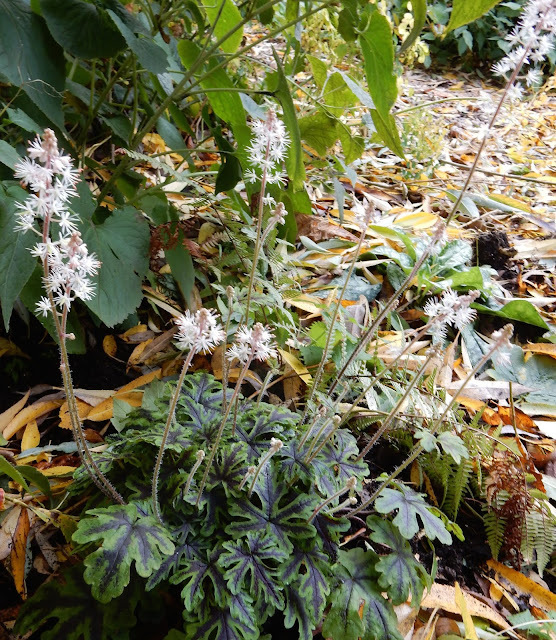 The foliage and flower of the Tiarella are beautiful, Anna. I've tried growing Tiarella here but it doesn't like my climate - sadly, I can't even get most Heuchera to live beyond a single season. That tiarella is just beautiful! Happy Bloom Day. I love tiarella, but we don't have good luck with it here. When I was a students at Longwood, they used it a lot in their woodland gardens. It's a great plant and looks so sweet in your vase. What a beauty and as you say the flowers are an added bonus, the leaves are exquisite. A perfect match of flowers and vase and w wonderful plant to boot! Happy GBBD. The leaves are so wonderful and beautiful. Maybe if the flower shoots will be pricked prior to growth, the leaves will continue to be producing more. But anyway the flowers are lovely as well. Happy GBBD.